Off to a great start Tat. The connection points on older kits like these are quite large. Sometimes you are better off using a saw to remove them than cutters, to avoid the stress issues. With 8 wheels to fit, I hope you get all level. 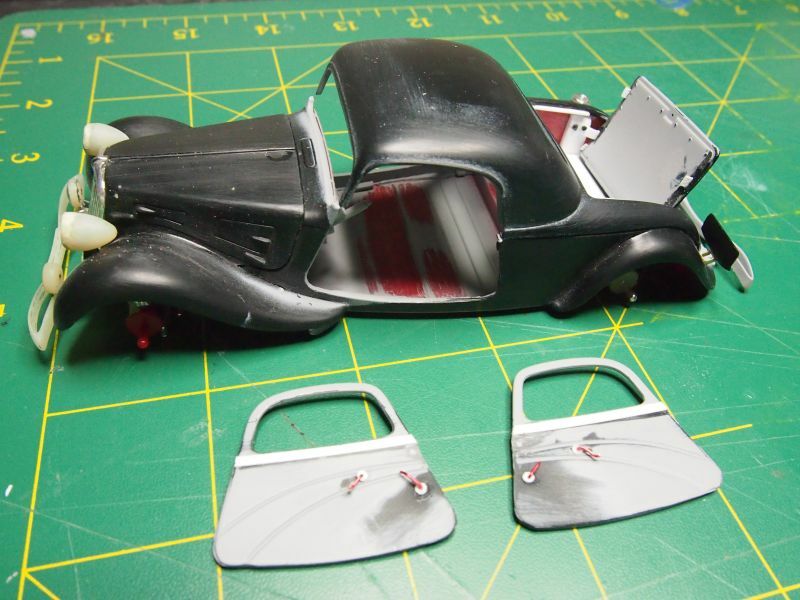 Here is some pics of the Citroen with details added - headlight shrouds, pedals, firewall panels, roof liner and seat supports. Had to trim a few millimeters off the bottom of that. 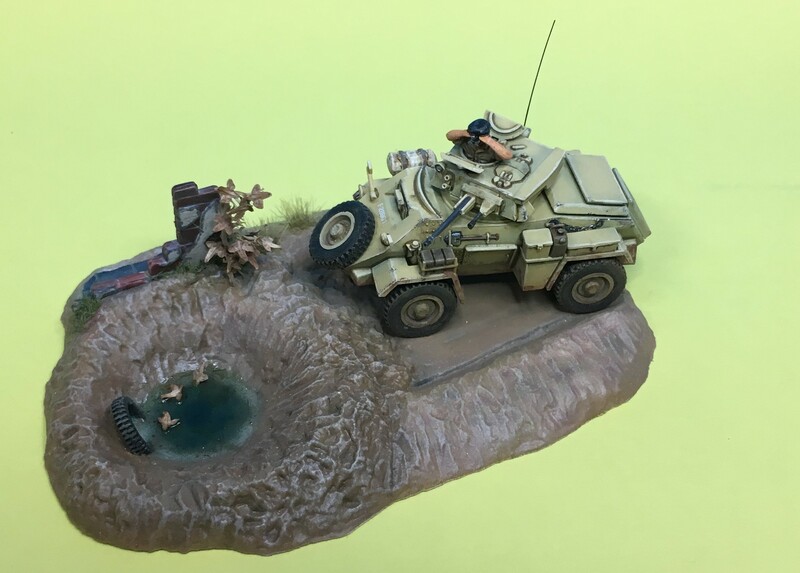 Matchbox made it to sit on the floor pan. 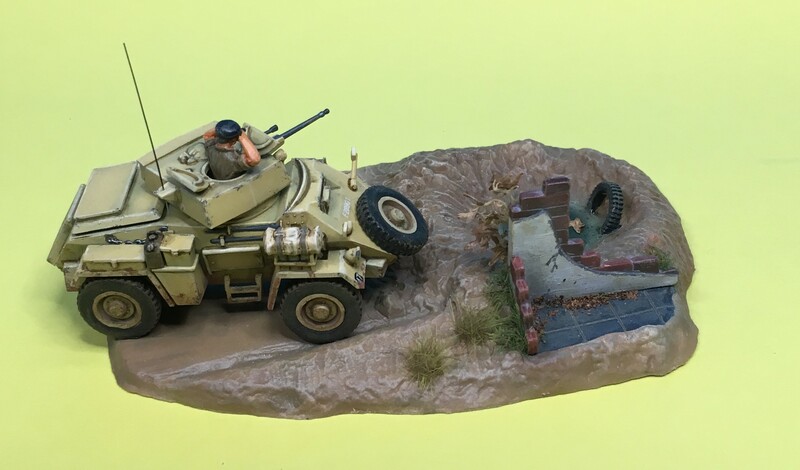 One good thing though is having the wheels and tires separate, thus easier to paint than having to deal with masks and the like. Yours is looking good too. I didn't know Matchbox did a Citroen. What I can clearly recall from their Blue Range is that 6-wheel Tyrrell car. Also the Bugatti roadster. what a great stash. I like the little Dingo from Matchbox. I built it this December. It is a nice little kit. I have never built cars made by Matchbox but this one surely Looks great! nice kick off. I have the Puma in the stash too and will be happy to learn from Your built. The Humber kit of Matchbox is fantastic. The newer plastic of Revell behaves much more better than the old one from Matchbox. 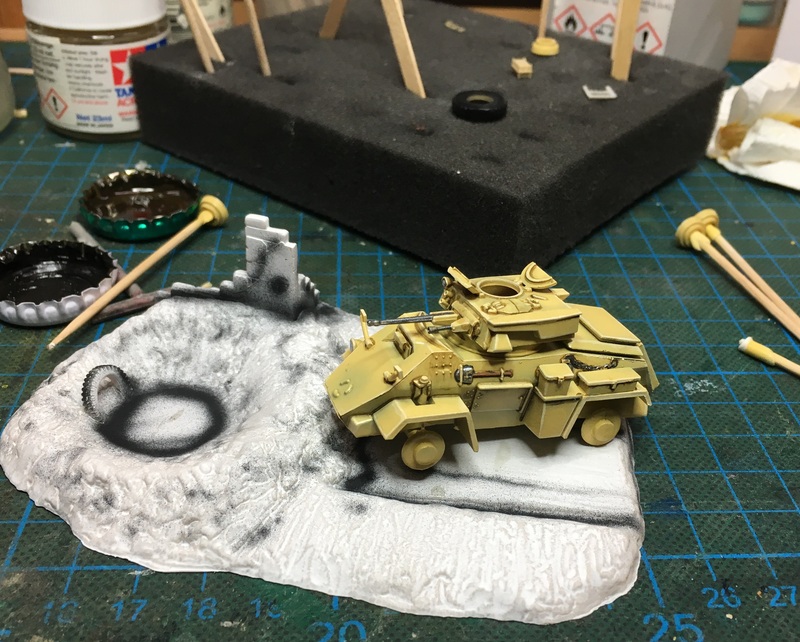 I painted the Humber roughly and will now go for weathering! Thanks Oliver -- hope to do good on this one. 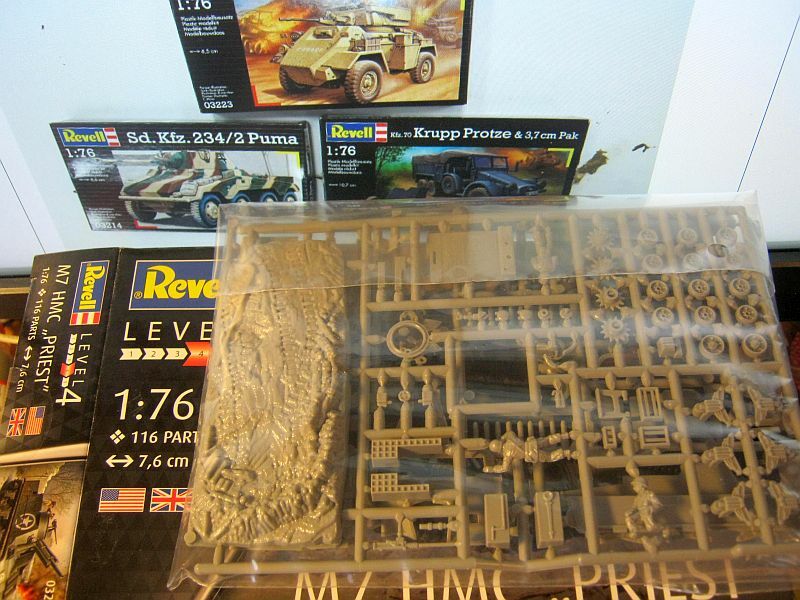 Wow, you sure work fast, you'll have time to build your Puma! Next the Jerry cans were sanded down. I find them too chubby they looked like suitcases. Hesitant at first as for sure the "X" will go, but I think it looks better overall. The streetlamp was just a blob of plastic. Looked around for small bits in the spares box to make one. Found some of these angled rods in a 1/144 kit, so that became the frame. 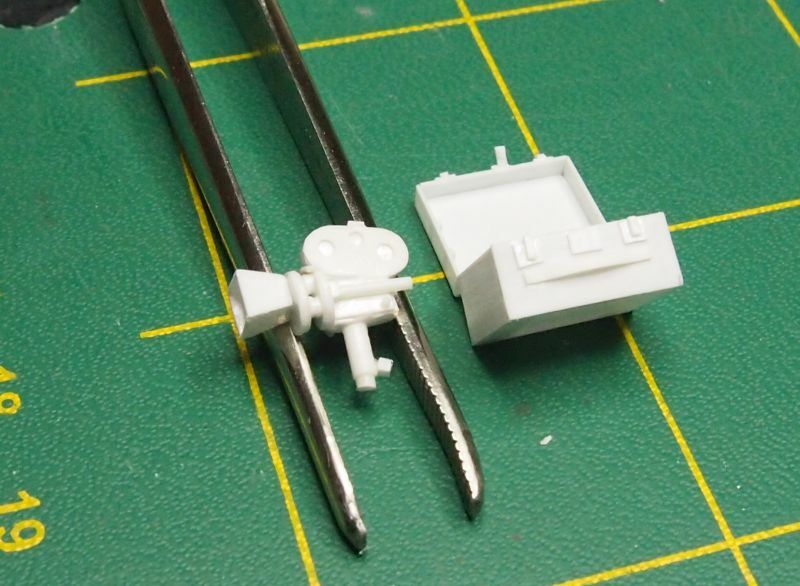 The "roof" was from 1/35 Pz IV vision port cover, cut and fitted into place. Good thing it's depicted as a damaged lamp post, so no worries on getting it straight, or even the need to put in some clear parts. Working next to paint the wheels before mounting them onto the tires. I didn't know Matchbox did a Citroen. What I can clearly recall from their Blue Range is that 6-wheel Tyrrell car. Also the Bugatti roadster. 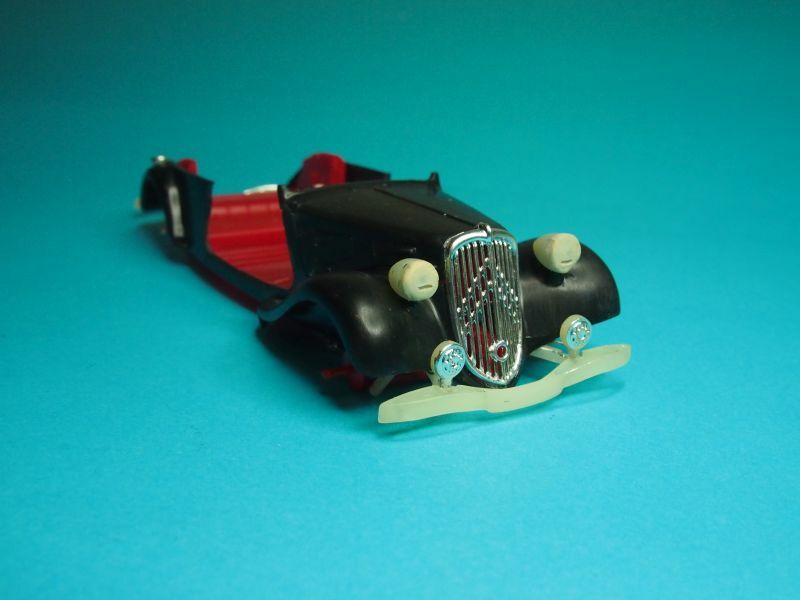 I had the SS 100 Jaguar and the Aston Martin Ulster - unfortunately both poorly built. "Fun Fact" the SS car company produced its 100 series vehicle and called it Jaguar. After WW2, given the connotations of "SS" at the time, the company decided to change it's company name - to "Jaguar". The rest, as they say, is history. Coming along very Nicely Oliver. I love the way the detail is popping out. Great work with the detailing Tat. It really does improve the look. That Lamp post is an eye catcher. I wouldn't worry about losing the 'x' as such, as the 'x' type jerry can was actually a very early war one. The design was replaced in 1940/41 by the type with a rectangle in the centre of an 'x' type impression and given its introduction date, the Puma would unlikely ever have had an 'x' type. Great to see that several people are already making some positive progress. . I almost forgot I had signed up for this adventure. 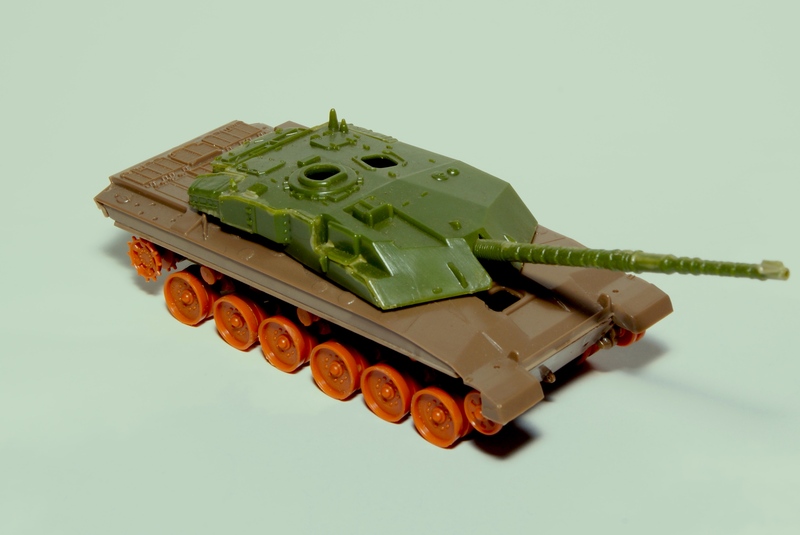 If anyone recalls I had a few choices at the start, The Matchbox labeled T-80 or M1 and/or the Matchbox Challenger I. I've decided to choose the Challenger as it was one of Matchboxes last designed kits and its been gathering dust on a shelf, forlornly fo too long. So her is where it stands after a much needed bath. 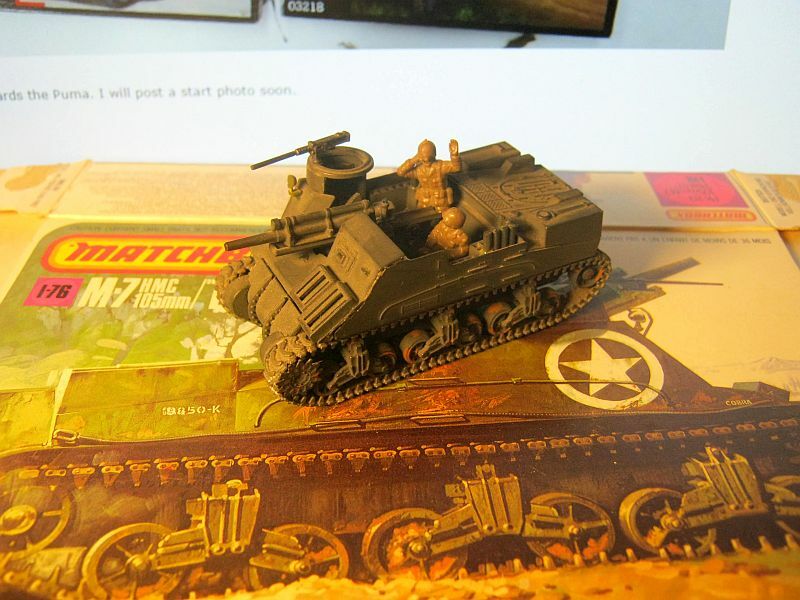 And here looking a bit more like a proper tank? Hope the images above work out as I'm still new using Imgur! Great to see you remembered us AJ! Okay, life got in the way this week, but I have managed to get the interior assembly finished. Had to re-work the storage compartment as Matchbox designed the lid to be movable with a central pivot, which is wrong. 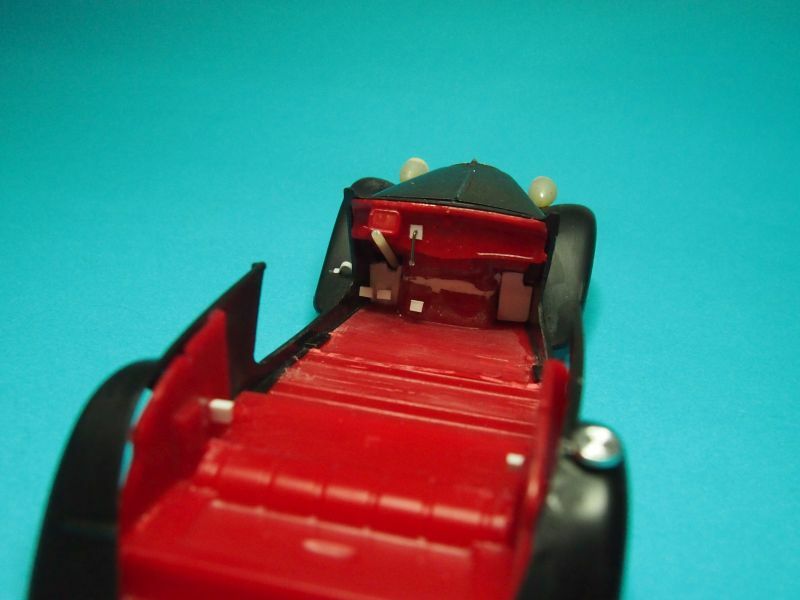 These had an option of a 'Rumble Seat' but you could never fit in the way Matchbox would have it represented. They give you no back rest, but do give you a seat, which if used would have you sitting with the rear window passing through your head! A bit of research and I was able to find some pics on various sites of different vehicles to show what needed to be done. I also shaved off the moulded on door handles and window winders and replaced them with wire and styrene ones. Matchbox had the door handle pointing so low you would need to reach down to your ankle to open the door. I also a strip of styrene under the window opening for the wooden door top that is missing on the kit and made a licence plate bracket from scrap etch fret - it is a square frame, not a L shaped bracket as per the kit item. The plate was thinned to be more to scale too. Dry fit components in pic. Now off for a bath and when dry, a primer coat inside for painting. Outstanding detail work on the lamp! The enhanced tools of the Puma look good, as well. Maybe I will find some time to start my kit, too. 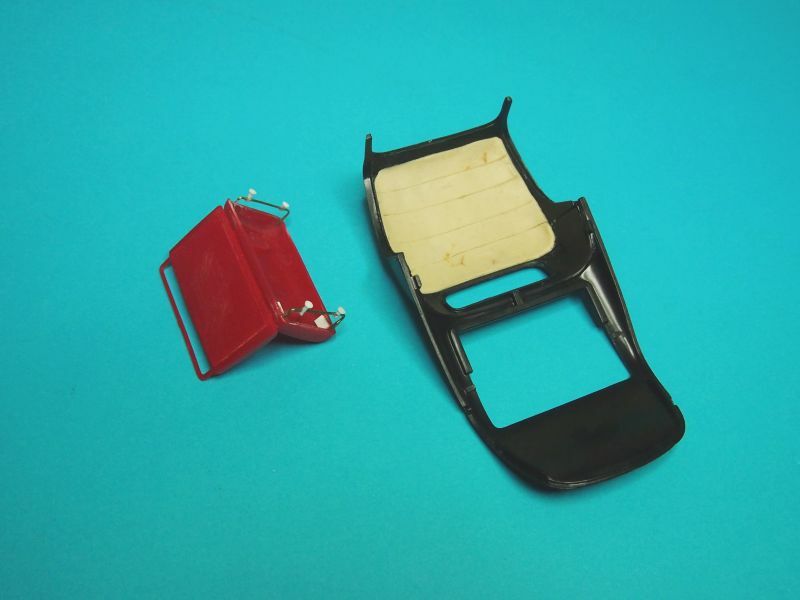 But, there is an old Fujimi F-86 that demands lots of putty and sanding. The Challenger seems to be a nice little kit. 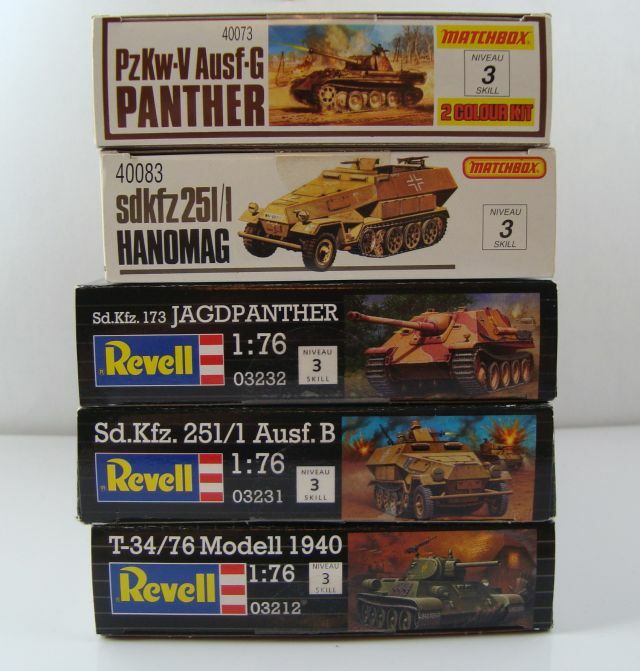 I think Revell got it still in the program. Your Citroen comes along very nice. I really like those tiny improved handles. 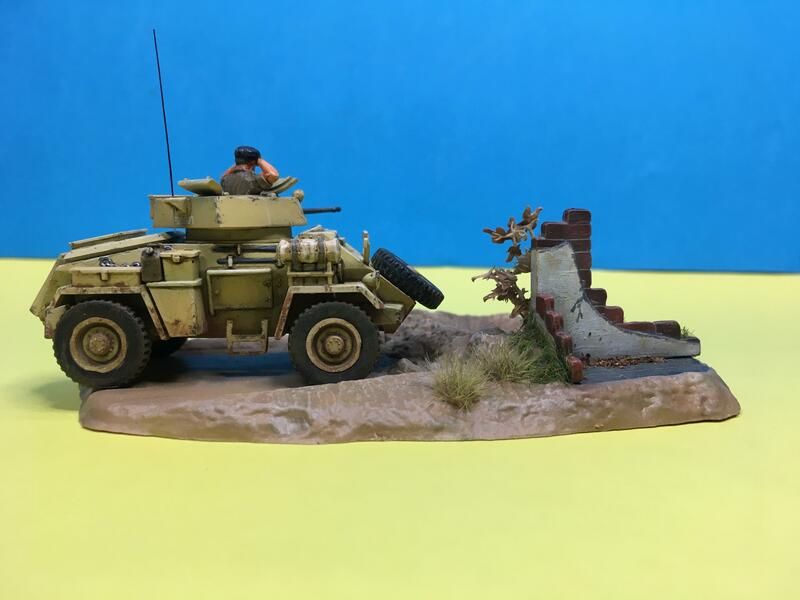 I managed to finish my Humber using the diorama plate provided by Matchbox. I guess, the crew-member is far too big for 1/76 scale but I like it! Looks great Oliver. Love the little extras on the base. 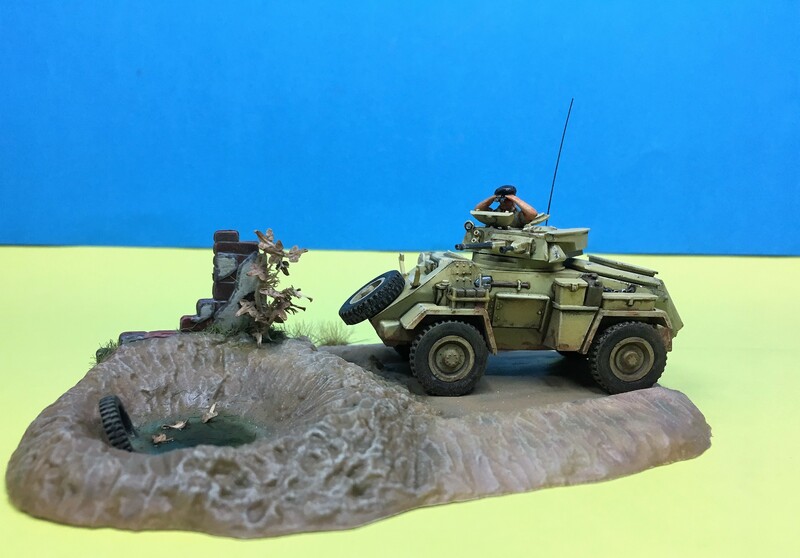 As to the figure, well the Humber was not that big and I think its okay. Thanks for joining in. Don't forget to post pics in the Gallery so you get your ribbon!!! Spent some time on my day off to get a little done on my build. Still test fitting some parts. Still time to find a kit an join! Nice to see the twins Robbie. Getting started a little late. Still thinking which one to go with. These are my choices right now. Leaning towards the Puma. I will post a start photo soon. Nice work Oliver -- congrats on your finish! How did you do the puddle, was it white glue? Whatever you choose, welcome aboard. Peter: Thank´s a lot. Glad You like it. I realize, I have the wrong tires for the desert from Your picture. 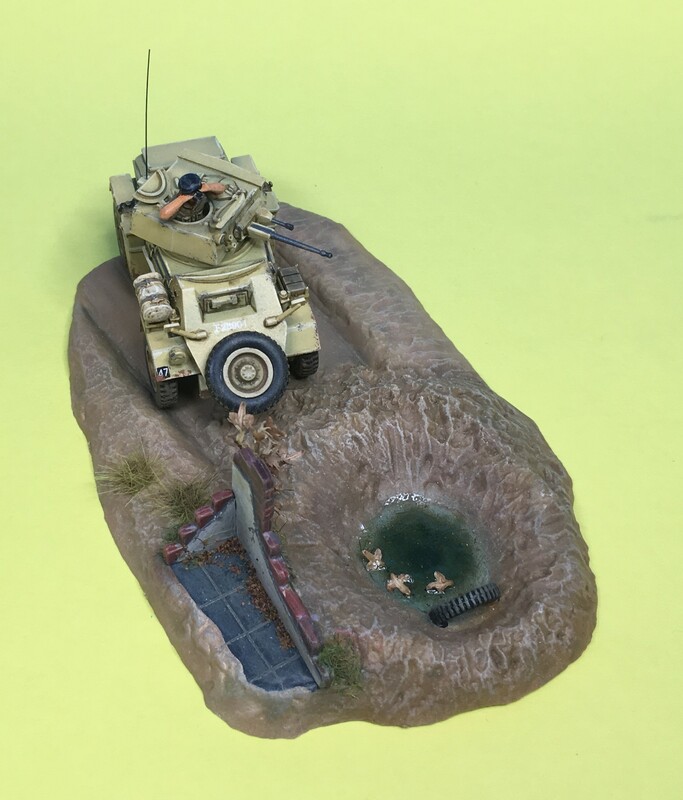 This is really a nicely packed Humber and a great scene for modeling, too! 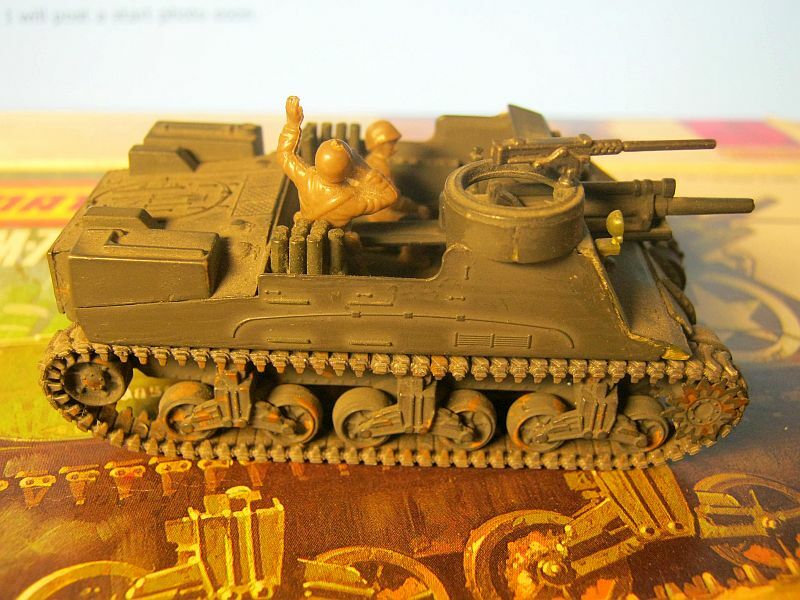 Tat: I used Revell´s contacta clear, but I think, White Glue will do the Job, as well! Stephen; Yes, the Protze will be great! My favourite, too! Looking better every time Robbie. Yes, but that is what the build is all about - remembering the good and the bad, and seeing how our skills have matured to overcome the little challenges. The very first vehicles I've made as a child were the Matchbox ones. I still possess some of them. Here is my favorite one - open top, the whole gun is visible. Made in 1984 or 1985. For some unknown reason it is unfinished. I still have somewhere decals for it, so maybe I will add them. The model is covered with more than 30 years old dust layer. Those brown spots are pretending to be mud splashes. So, here is my entry photo. I will do my best to reproduce another Priest a bit better than this upper one. 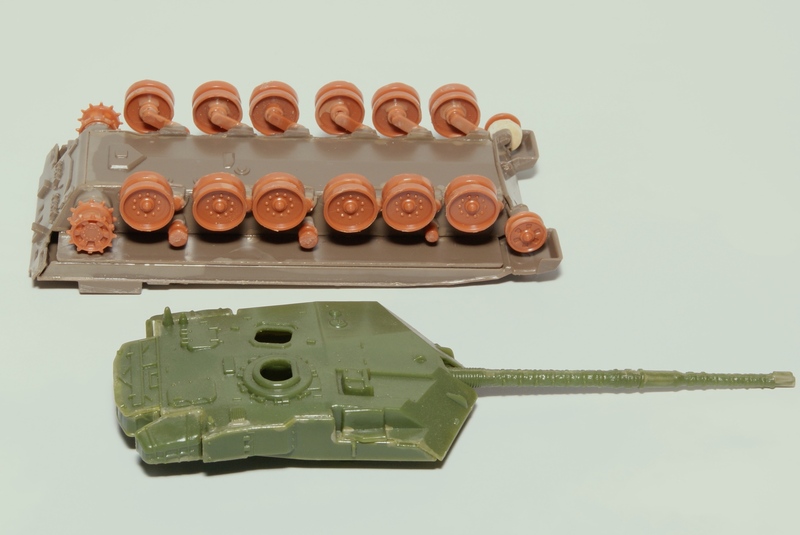 As I'm going to do a very early M7, I will use tracks and suspension from Mirage's Grant and some leftovers (e.g. Browning M2) from Dragon's M4. 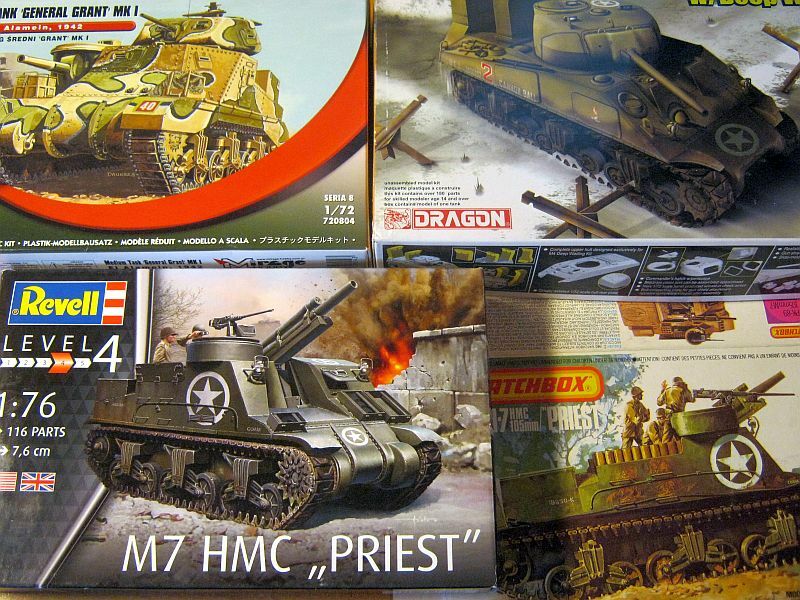 If there will be enough time to do another model (I'm also involved in Italian campaign) I will start something from this pile.